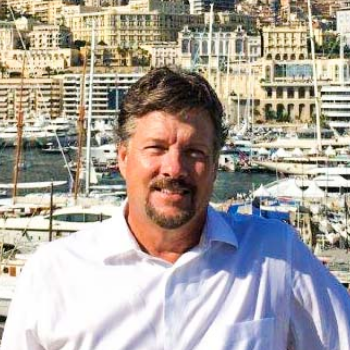 Brian Franc of United Yacht Sales – Emerald Coast Division has over 22 years of successful yacht sales and manufacturing experience, having started his boating career in Atlanta, GA in 1995. His extensive knowledge expands the globe of many yacht manufacturers such as Monte Carlo, Horizon, Viking, Hatteras, Ocean Alexander, Benetti, Azimut, Fairline, Ferretti, Marquis, Marlow, Princess, Prestige, Sunseeker, Bertram, Grand Banks, Maritimo, Tiara, Sea Ray, Cruisers, Regal, PLUS many others providing Brian the expertise to find the ideal yacht for his clients. Additionally, Brian is the Brand Manager for Newport Offshore; a Power Catamaran Custom Builder from 50 – 112Ft. Looking for a Custom Super Yacht built in Europe or China? Brian has the contacts and relationships already established. Brian attends the Monaco Yacht Show almost yearly, meeting clients and educating himself on the Latest offerings from the Super Yacht Industry such as the New 70Meter Heesen Yachts “Galactica SuperNova”. In addition, he has attended and participated in other International Boat Shows such as the Dubai and Genoa Yacht Shows, and major USA Boat Shows in Miami, Fort Lauderdale, Palm Beach, St. Petersburg, Stuart, Rhode Island, New Orleans, Houston and The Wharf Boat Show in Orange Beach. Moreover, he attends and works many other smaller boat shows with the objective to increase his global and domestic awareness, exposure, and expertise in finding the “Right Yacht Fit” for his clients no matter their ultimate destination. Brian has been a Licensed Certified Professional Yacht Broker (CPYB) since 2007 and a long-standing member of the Florida Yacht Brokers Association (FYBA), recently renamed the International Yacht Brokers Association (IYBA). He has previously represented top dealerships such as Galati Yacht Sales, Allied Richard Bertram Marine Group, and was employed by Super Yacht Builder, Westship World Yachts and Yamaha Boat Company in Upper Management positions. As an IYBA member broker, Brian agrees to fully comply with the IYBA Code of Ethics & Business Practice as a condition of membership and furthers his commitment to maintain the highest industry professional standards. When considering whether to Buy or Sell your next yacht Brian has a fresh “New and Improved” marketing approach to selling your yacht. His enhanced strategy utilizes the latest cutting-edge technology in today’s complex yacht marketing environment. Why List your boat with Brian Franc? In addition to these new techniques and marketing strategies, Brian Franc will personally assist you in your strategic planning of your next yacht purchase or research and analyze the optimum selling strategy when listing your boat for sale. Brian will take the time to explain the entire boat purchase process from making an offer, to trial run and survey. He can also assist in directing you to other yachting items such as boat financing and yacht insurance. Along with Brian’s strong Domestic marketing of your boat, he adds a Global exposure rarely seen in the industry that has helped international boat buyers worldwide find your boat. For Boat owners looking to sell their yacht, Brian will market and sell your yacht utilizing the latest Drone Technology, mobile marketing technology, along with the best traditional strategies available.